Coasts are places where the sea meets land. That's simple. Complexity comes in when we look at the great variation in structure and biology of coasts. 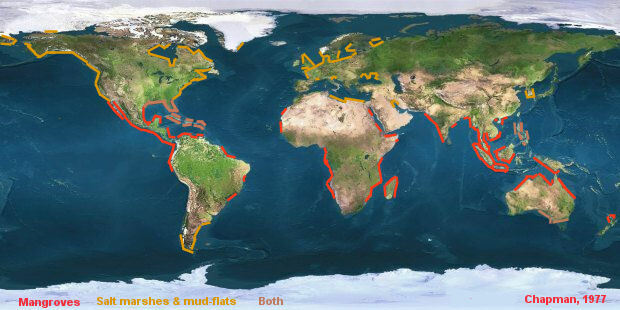 For many years geologists have tried to give an accurate classification of coasts. A widely accepted classification is made by Francis Shepard (1937) who distinguished 52 coastal types. He even added some coastal types with the qualification 'No examples recognized but probably exists'. But lets keep it simple, here we'll focus on marine life. As far as geology concerns we'll just make a division in three types: muddy, sandy and rocky shores. To find some structure in life on the shores we also have to take into account some other factors. Temperature, depth and visibility are also crucial when it comes to marine communities at the coasts, so we will have to take them into account. Muddy shores develop on places where clay and silt (particles finer than sand) are deposited by river currents or by tidal action. In places where the velocity of the water is low enough the fine particles will sink to the bottom where bottom organisms will fixate them. In temperate regions this is the place of mud-flats with saltmarshes higher up the coast. In tropics these muddy shores are mostly covered by mangroves. If the visibility is high enough there is a chance that sea-grass communities occure in deeper water. Sandy shores occure on places where the velocity of the water inhibit the finest particles to settle on the bottom. Sand (or gravel) is heavy enough to settle on these places. On exposed coasts wave action will favour formation of beaches where organisms only survive by buried in the sand. On protected sandflats the situation is different, organisms can live on the bottom as well. Subtidal sea-grasses may grow on the sand. Rocky shores in temperate regions are inhabited by a great diversity of animals and algae. If visibility allows kelp beds grow in deeper water. In the tropics where the mean surface temperature is above 20°C rocky shores are mostly covered by corals. Table of possible communities under different geological conditions. Note that light is a crucial factor for occurence of subtidal communities.